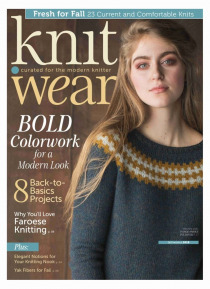 Introducing the new special issue from the editors of Interweave Knits: knit.wear, simple handknits for the thoughtful knitter! knit.wear focuses on conceptual, wearable knits with clean, modern aesthetic—built in unusual ways with interesting techniques. Explore design elements such as drape, ruffles, and pleats; knit the perfect sweater; and more.